We advance environmental education in Alberta. As a leader in environmental education, we help Albertans develop the skills they need to address the root causes of environmental issues. We connect children and youth to nature, by unleashing their potential and encouraging positive environmental action. Children spend less time outside and more time indoors in front of screens. We have an responsibility to learn to live sustainably, to enjoy and steward Alberta’s wonderful natural resources, and prepare future generations to do the same. There are few resources to help Albertans develop a passion and learn the skills to protect our planet, even in curriculum. As a leader in environmental education, ACEE works at a systems level to reform K-12 education curriculum and bring environmental education into the mainstream; at the grassroots level by guiding children and youth to become environmental leaders in Alberta; and every level in between through its partnerships and professional development for educators. We currently have a superb opportunity to advance environmental education in the new K-12 Alberta curriculum. The last time this opportunity existed was 20 years ago. At that time, our Executive Director Gareth Thomson successfully worked with Education staff to add a wetlands unit to the fifth grade curriculum; since that time almost 1 million Alberta youth have gone through that unit to experientially understand and appreciate the complex nature of the wetland ecosystem. We believe that the health and wellness of Albertans relies on a healthy environment. We promote environmental education so that Albertans will understand the interconnections between the environment, economy, and society – and develop the knowledge, skills, attitudes, and behaviours to create a sustainable future. Propose new curriculum for our 700,000 students. To build a prosperous and sustainable future for our province, we need to provide the students in K-12 schools in Alberta with new curriculum that will dramatically increase their energy environmental, and climate literacy. We’ve created ‘Curriculum for a Sustainable Future,’ which outlines key concepts and student learning outcomes for science, social studies and wellness that are needed for students to be energy and environmentally literate, and identifies teaching and learning resources and assessment techniques for teachers. This document is a key tool in our onging work with Alberta Education. 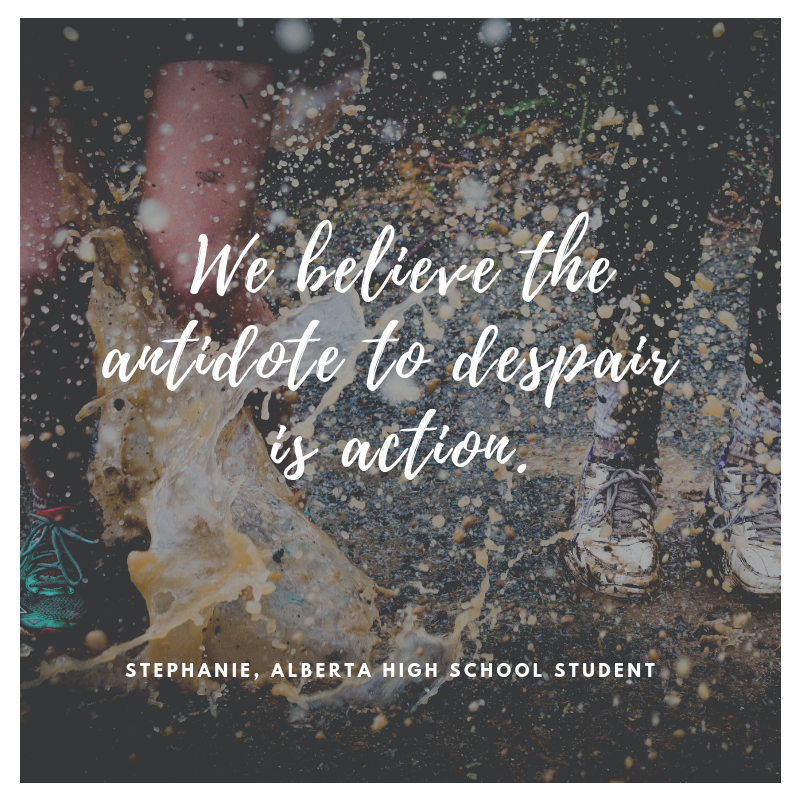 Engage youth around how ‘Alberta Schools can show Climate Leadership (Year Two).’ In 2016 we worked with over 3000 Alberta high school students on this topic. They presented their findings to the Education and Environment and Parks Ministers in June. This year the youth will speak to Alberta’s educational leadership at provincial and regional meetings, and work with them to help identify and take the next step towards climate leadership. Get Outside and Play Network. ACEE leads the Get Outside and Play network, which focuses on getting preschool children outdoors to enjoy and appreciate nature. There are now 600 members in the network from sectors such as health care, environmental education, play, sport, recreation and parks, child care, and early childhood development. Network activities include resource sharing, webinars, events and workshops. Get Outside and Play Week. At the end of May, ACEE organizes an annual Alberta-wide celebration of outdoor nature play. Childcare centres, families and communities use this week to jumpstart active outdoor nature play through direct, hands-on experiences and sharing inspirational stories that support the value of active outdoor nature play in the early years, with events taking place across the province in parks, childcare centres and backyards! Participants register their activity through getoutsideandplay.ca to receive resources, inspiration and ideas to help them incorporate outdoor nature play into daily life. Develop and deliver Energy Efficiency Education. Through a joint venture with Greenlearning.ca, we’re developing a new hands-on energy efficiency education program for junior and senior high school students, using new circuit meter technology that ‘makes energy visible.’ This program epitomizes excellent education: students increase their energy and environmental literacy, learn experientially through their project work and reporting to school decision-makers, take action, reduce greenhouse gases, and help schools reduce their utility bill and carbon levy payments! Help Alberta’s educational leaders ‘Take the Next Step’ towards climate leadership. We’ll help board trustees and superintendents from Alberta’s seventy-plus school boards ‘take the next step’ when it comes to advancing both student learning and school infrastructure. In partnership with Alberta Education, the Alberta School Boards Association, and the College of Alberta School Superintendents, we’ll build a workshop series and a Climate Leadership Clearinghouse and Knowledge Centre to engage these education leaders and support their work, culminating in a 2018 Summit. Enhancing Student Voice through Climate Change Education. We’re working with the Environmental Law Centre on this program to help students understand the complexities around climate change and engage in project-based action. Alberta Green Schools. This program creates a culture of energy literacy and environmental stewardship in Alberta schools. We help teachers connect to quality learning resources as they create a school-wide culture of environmental stewardship and celebrate students’ green accomplishments! ACEE connects youth to nature, unleashing their potential and encouraging action to steward the environment. There are almost 1 million youth in Alberta. This is the future. ACEE works to increase their environmental, energy and climate literacy, and help them develop the skills they need to care for the planet we all share. But we can’t do it alone. Every donation, no matter what the size, makes a big difference! ACEE works closely with businesses who share our vision to advance environmental education in Alberta. Additionally, you can sign up for our monthly e-newsletter to learn more about ACEE and receive tons of environmental education resources.